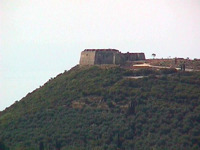 Between Anthousa and Agia on a dominating hill to the whole region of Parga, is built a vast imposing fortress. It is the fortress which Ali Passias built so as to supervise and besiege the rebellious town of Parga. On 17th February in 1814 killed all the habitants of the wider region and Agias. In this way he took revenge from the autonomous habitants who had allied with the habitants of Parga. In the same year Ali Passia deceived the french administrator of Ionias Islands Danzelot by a clever note and built the castle. The european architector built it polygonal with high walls which offered efficient defence with its big tower for cannons. On the north side of the castle there are two bastions and a scalding for the protection of the entrance. Inside at the big tower there is an arched circumferential corridor with arches inside it. Two ruusian cannons bought by Ali are on the ground. The castle nowadays is in good condition despite its crevasseses that are repairable. The view from the castle at night is fantastic especially during events when it is lightened.